Ben has extensive knowledge and experience in successfully developing and implementing improvement programmes in the health, safety, sustainability and quality disciplines. He has over 24 years experience in the construction and support services industries. Ben has operated both at a corporate director and project level across a diverse range of operations including healthcare, education, commercial, residential, infrastructure and process industrial both in the private and public sectors. Ben has worked extensively internationally assisting business to achieve high standards of EHSQ with multinational workforces and challenging local conditions. Currently, Ben is the HSE Director for Mace International based in their Dubai office, covering APAC, MENAI, Africa, Europe and North America. Having previously worked for Wilmott Dixon and Skanska, where he was the UK EHS Director, prior to joining Mace, Ben was the HSEQ Director for Carillion MENA. 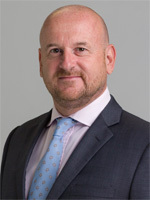 With this extensive industry experience behind him, Ben has represented the industry on a number of UK and International Health and Safety bodies including CITB health and safety committee, UK Health and Safety Executive industry safety Trojan Horse programme and remains an active member of a number of strategic international safety bodies. Ben continues to play a pivotal role in the development of industry and business health and safety improvement strategies and initiatives, whilst working to deliver a zero harm ethos on many internationally recognised, high profile projects in his portfolio such as Dubai-i UAE, Kingdom Tower KSA, The Crest India, Porto Montengro Montengero and Caspian Waterfront Azerbaijan to name but a few. He prides himself on always developing high performing teams to help drive continuous improvement in industry and the organisations he works in.